Profi Automatic Feeder has developed an alternative to clockwork feeders! The Profi Automatic Feeder has many applications, including Fry feeding, Feeding of koi and ornamental fish, Hobby ponds - At an unbeatable price! The special mechanism of the new Profi Automatic Feeder has been taken from the established Profi Automatic Feeder, a success for many years. This mechanism ensures that the food is delivered to the fish in the required quantities, intact, and without dusting. The food is delivered by a portioning finger, which is driven by a 12V or 230V geared motor. The feeding rate is about 100g per minute according to the feed quality and size. The feeder comes complete with a stainless steel holder, hinged lid, to-the-second timer and can accept sizes from fry feed up to 9mm. This Profi Feeder is deliverable in standard version for 230V. The problems and disadvantages of clockwork feeders, where humidity causes the feed to stick together and go mouldy, are solved. Feeding is programmed to take place intermittently as required. Thus fish don ́t stay below clockwork feeders which feed continuously. The hopper capacity is 5 kg, so can store enough for several days, and the feed level is visible from outside. For convenience, the lid is attached by a hinge to the hopper. A stainless-steel ring cradle (length 25cm) is included. Profi Automatic Feeder has developed a completely new timer, at the end of the 10 cable for this feeder. This enables feeds to be set to the second. The clock has been designed to be user friendly. With a main button and the button “+“ or “–“, all feeds can bet set quickly and easily. It is only necessary to set the start and end of feeding, the required number of feeds, and the total feeding time (minutes or seconds) per day. The feeding programme is then created automatically! This timer control offers the convenience of being able to take into account growth of the fish and raise the feed ration, daily, accordingly. It couldn ́t be more convenient! The Pro Digital Koi Feeder is without doubt a quality automatic feeder and has been in use on our own ponds for the last 10 years, always providing optimum results and added benefits for any Koi pond. The feeder is fabricated from high grade ABS plastic and runs on 240 volts. The sophisticated programmable/time clock will permit many possible different feeding schedules. An override facility as well as a cancelled facility without loss of timed schedules is also possible. The clock is set to current time and the choice of delivery times is enormous with actual feeding times set from a minimum feed of 1 second to 60 seconds up to 15 times a day. The Pro Digital Koi Feeder offers a large holding capacity of approx 4kg of food dependant on size of pellet and a visible window of stock quickly determines when a refill is required. Unlike most other feeders, the Pro Digital Koi Feeder delivers food in a random mode across the surface of the pond, with the use of a cleverly designed flicker system, thus preventing greedy or hungry fish waiting at the feeding point in readiness to clear the latest feed, whilst at the same time depriving slower and more docile fish their share of the daily food. 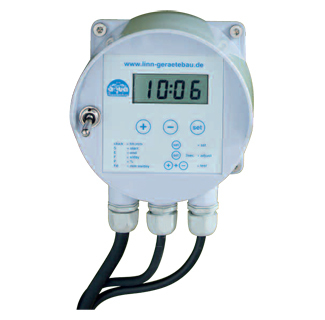 These mains operated Digital Koi Feeder's have been built from durable plastics and are CE approved the feeder is primarily designed for use with the timer but can be used with any mechanical or electronic timer switching a 220-240v AC 3 amp current.. This Pro Digital koi feeder timer will make koi Feeding a fully Automated process with its easy programming and versatile functionality . This new Digital Koi Feeder which is fully CE approved has been designed with the aquatic enthusiast in mind and enables a comprehensive range of feeding patterns which can be programmed for continuous feeding through all seasons. Please Note: This Feeder comes complete with timer, ready to go ! Although you can buy the timer as a spare part or even a 110 volt timer for our American customers. Cloverleaf past Auto Fish Feeder range were proven to be extremely successful, but have through redesign now become even more versatile and safer via the introduction of the Mk3 Low Voltage models. 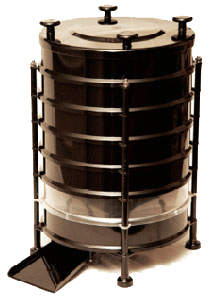 With the transformer integrated into the computerised timer the Cloverleaf auto fish feeders are a breakthrough in both sophistication and exceptional value for money, and will be appreciated by all pond keepers who either have frequent holidays, or by those who are away from their ponds during most of the day. 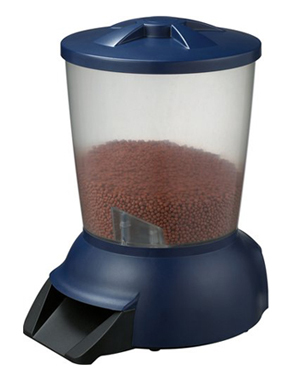 Cloverleaf Auto Fish Feeder models remain available in three sizes - the Small PF1-LV (5 litre pellets), Medium PF2-LV (10 litre) , and Large PF3-LV (20 litre) , with the largest model measuring approx 530mm high x 275 dia. The timer on the Cloverleaf Auto Fish Feeder can be set for “minutes & seconds” (with 1 second being the ultimate minimum), and as a consequence this makes the autofeeder suitable for the smallest of ponds or even quarantine systems. It is believed that this facility makes the Cloverleaf Auto Fish Feeder totally unique in the value for money stakes. Feeding small amounts at frequent intervals is scientifically known to be the best of techniques for the benefit of both fish & filtration systems, and the computer controller with digital display allows just this. Up to 8 feeds a day over any given period are possible, with full control over the exact amount being fed. Although the Cloverleaf Auto Fish Feeder are IP55 protected the computer programmer unit needs to be housed in a dry sheltered position. In instances where playful domestic pets or young children have access to the pond the auto feeder casing should ideally be fixed down to the adjacent decking/paving for stability and security using the pre drilled holes provided. All models are supplied with a delivery chute (for use where required). The FOK AutoFeeder is without doubt the Rolls Royce of automatic feeders and has been in use around the world to our knowledge for the last 25 years, always providing optimum results and added benefits for any Koi pond. The feeder is fabricated from high grade ABS plastic and runs on 110 ac volts. The sophisticated programmable/time clock will permit many possible different feeding schedules. An override facility as well as a cancelled facility without loss of timed schedules is also possible. The clock is set to current time and the choice of delivery times is enormous with actual feeding times set from a minimum feed of 1 second upwards. The FOK AutoFeeder offers a large holding capacity of approx 4kg of food dependant on size of pellet and a visible window of stock quickly determines when a refill is required. Unlike most other feeders, the FOK delivers food in a random mode across the surface of the pond, with the use of a cleverly designed flicker system, thus preventing greedy or hungry fish waiting at the feeding point in readiness to clear the latest feed, whilst at the same time depriving slower and more docile fish their share of the daily food. With the Aqua Forte koi Feeder now you can feed your koi up to 10 times a day, no matter if you are at home or away your koi will still eat on time and stay healthy and grow faster. Computer works on rechargable battery, lasts 1 month without power. This Solar Powered Auto Feeder by KAMIHATA (the makers of Hikari Koi Food) comes with many exciting features including a back-up battery, can dispense up to 12 times a day, holds up to 6 kg of koi food, has a variable spread control. This Solar Powered Auto Feeder is the Number one feeder in Japan and is now available through Absolute Koi. No leads, cables or power supply needed! Koi Cafe automatic feeders for ornamental fish offers the ease of regular feeding up to 8 times a day. The innovative design prevents the food getting into contact with moisture. Provided with an inovative sight glass to check the quantity of food (max. 2 kg.). The Koi Cafe is delivered with a digital timer and rechargeable batteries (solar panel is optional). The Battery charger is sold separately. The timer can be set from 2 till 60 seconds. Three different colors. Manufacturer Sweeney Enterprises have been producing automatic feeders of the highest quality for over 30 years and therefore gives a 3 year guarantee! Koi grow better and are more healthy when the food is offered in smaller amounts, multiple times a day. Filters become less polluted and also less peaks to endure. With the new Aqua Forte koi Feeder now you can feed your koi up to 6 times a day, no matter if you are at home or away your koi will still eat on time and stay healthy and grow faster. This new Aqua Forte koi Digital Koi Feeder which is fully CE approved has been designed with the aquatic enthusiast in mind and enables a comprehensive range of feeding patterns which can be programmed for continuous feeding through all seasons. Feeding small amounts at frequent intervals is scientifically known to be the best of techniques for the benefit of both fish & filtration systems, and the computer controller with digital display allows just this. Up to 6 feeds a day over any given period are possible, with full control over the exact amount being fed. Battery Power or 12 volt transformer. 12 volt transformer with 5m cable included. Feeding your fish with an automatic feeder has many advantages. you get the most out of your fish by always precisely providing the correct amount of feed. This ensures optimal growth. as the feed is dosed in smaller amounts at a time, this has a beneficial effect on the health of the fish. unnecessary pollution of the water and additional strain on the filter can be prevented if your fish eat all the feed that is provided. With the programmable timer, it is possible to carry out fully automatic feeding between 1 and 24 times a day. The quantity of feed can be set by adjusting the number of dosing seconds per hour, the number of dosing seconds per hour can be set between 0 and 120 seconds. Professional feeder suited for aquaculture and koi ponds. Allows hourly feeding from 1 to 120 seconds. Extreme easy programming one button! Suited for pellets sizes 2 to 9 mm. Comes with adaptor ring for pellets smaller than 4 mm. Comes with mounting bracket. 230 Volt, 10 meters of cable. Holds up to 7 liters of food. Feeding times adjustable per hour from 1 to 120 seconds. Multiple daily feedings is beneficial for fish growth. Feeds automatically at set times. Not suited for sticks and flakes.